Currently Presiding Judge of the North Eastern Circuit, Mr Justice Globe talked to students about his life and career at a ceremony where he was awarded a honorary degree of laws. The University of Liverpool has awarded an honorary degree to The Honourable Mr Justice Globe at a ceremony at the Philharmonic Hall today. Currently Presiding Judge of the North Eastern Circuit, he had previously spent eight years as Honorary Recorder of Liverpool, the highest legal role in Merseyside. Together with Merseyside’s chief crown prosecutor, he devised an early guilty plea scheme – subsequently adopted nationally – in a bid to reduce waiting times, paperwork and costs, while also bringing quicker justice for victims. He was appointed to the High Court and knighted in 2011. 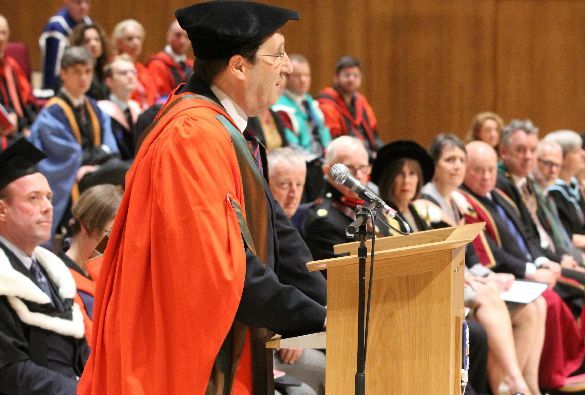 He receives his degree in a week when the University has also honoured, The President of Ireland, Michael D Higgins; the Archbishop of Canterbury, Justin Welby; and Príncipe de Asturias Professor of Contemporary Spanish History at the London School of Economics, Paul Preston.